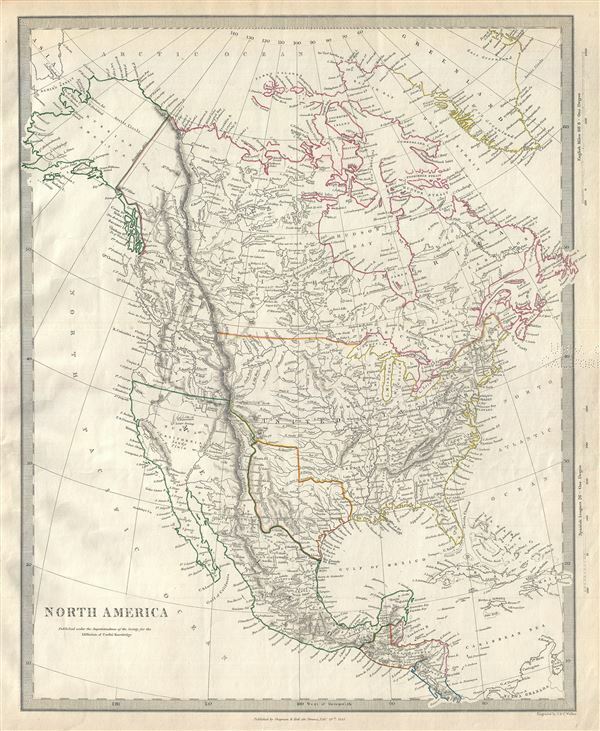 This is a scarce and interesting 1843 map of North America issued by the Society for the Diffusion of Useful Knowledge, or S.D.U.K. The map covers all of the United States, Canada, Russian America (Alaska) and Mexico predating the Mexican American War (1846-1848) and the Treaty of Guadalupe Hidalgo. The 1848 treaty, which formally ended the war, annexed all Mexican territory north of the Gila and Rio Grande Rivers, including the short lived Republic of Texas, to the United States, increasing the country's size by about 35%. The nascent Republic of Texas, here in its final year as an independent republic before being annexed into the United States, is presented in its largest iteration. It shows the full extent of the Republic of Texas Claims, with a stovepipe handle extending nearly as far as Cheyanne, Wyoming, and a western border occupying much of modern day New Mexico and Colorado. … the Large Lakes of Tule, situated farther south. Of these lakes very little is known; they are said to be two or three in number, forming a chain about one hundred miles long, in the environs of which, is a large population of Natives. A number of additional elements are of some interest, including the exceptionally narrow Lake Michigan, the 3 buttes in modern day Idaho (an important landmark of the Oregon Trail) and the identification of the 'American Fur Depot' to the east of 'Lake Youla' where Salt Lake City is located today. John Jacob Astor's establishment of Astoria on the Columbia River is identified. The map also notes the apocryphal Buenaventura River is shown with an origin in the a Large Swamp in the Great Basin running westward to San Francisco Bay. The Buenaventura is the last incarnation of the apocryphal River of the West, a long sought after speculative alternative to the Northwest Passage. The mapping of Buenaventura here references legitimate discoveries by Escalante of the White River and the Sevier River, mistakenly associated with the River of the West and given an erroneous outlet into San Francisco Bay. Further north, the United States – British America border is missing, leaving the possession of the Oregon Territory ambiguous. This map was originally copyrighted in 1843, but was issued in Volume two of Chapman and Hall's 1844 edition of Maps of the Society for the Diffusion of Useful Knowledge. It was engraved by John Walker of J. and C. Walker. Very good. Bears University of California Library Stamp, from which it was deaccessioned, in margin. Blank on verso. Rumsey 0890.125. Phillips (Atlases) 794.